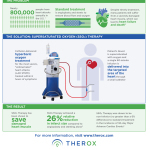 IRVINE, Calif.--(BUSINESS WIRE)--TherOx, Inc., a privately held medical device company focused on improving treatment of acute myocardial infarction (AMI), announced that the U.S. Food and Drug Administration (FDA) granted premarket approval for its SuperSaturated Oxygen (SSO2) Therapy. SSO2 Therapy provides interventional cardiologists with the first and only FDA-approved treatment beyond percutaneous coronary intervention (PCI) to significantly reduce muscle damage in heart attack patients. SSO2 Therapy delivers hyperbaric levels of oxygen directly to the ischemic heart muscle immediately after the coronary artery has been successfully opened by PCI (angioplasty and stenting). It is indicated for patients who suffer the most serious kind of heart attacks, left anterior descending ST-elevation myocardial infarction (LAD STEMI) – also known as the widowmaker – treated within six hours of symptom onset. SSO2 Therapy is adjunctively administered immediately following successful stent placement, with no delay in PCI treatment. SSO2 Therapy has been shown in multiple randomized prospective clinical trials to consistently and safely reduce infarct size in anterior AMI patients and thereby improve outcomes. SSO2 Therapy is indicated for the preparation and delivery of supersaturated oxygen to targeted ischemic regions perfused by the patient’s left anterior descending coronary artery immediately following revascularization by means of percutaneous coronary intervention (PCI) with stenting that has been completed within six hours after the onset of anterior acute myocardial infarction (AMI) symptoms caused by a left anterior descending artery infarct lesion. A heart attack is typically caused when blood and oxygen flow to the heart is blocked or reduced and the heart’s tiny capillaries swell, further restricting blood flow. If not quickly restored, irreversible damage to the heart muscle, or infarction, will occur. SSO2 Therapy is based on the known benefits of hyperbaric oxygen treatment in improving the body’s ability to heal. SSO2 Therapy infuses superoxygenated blood to improve microvascular flow and has been shown to save heart muscle by reducing infarct size. 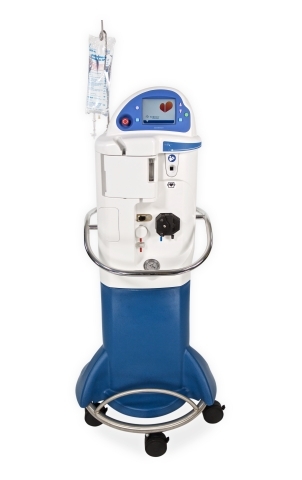 Immediately after the coronary artery has been opened by PCI, SSO2 Therapy delivers a one-time, 60-minute infusion of the patient’s superoxygenated blood to the targeted ischemic area of the heart through a small catheter. 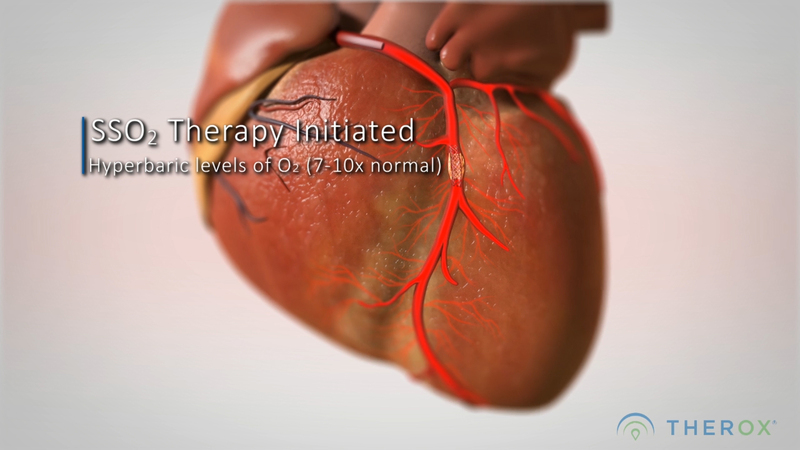 The superoxygenated blood helps reduce capillary swelling to restore blood flow to surrounding tissue and decrease infarct size.7,8 SSO2 Therapy is aligned with current guidelines for interventional cardiology procedures. 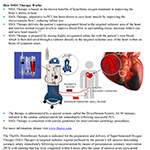 TherOx is a privately held medical device company based in Irvine, California, focused on developing and commercializing SSO2 Therapy for the sizeable AMI patient population to save hearts, improving and ultimately saving lives. For more information about TherOx, visit www.therox.com. 1 Stone GW, et al. Effect of supersaturated oxygen delivery on infarct size after percutaneous coronary intervention in acute myocardial infarction. Circ Cardiovasc Interv; 2; 366-375. Sep 2009. 2 Stone, G.W. et al. Relationship Between Infarct Size and Outcomes Following Primary PCI: Patient-Level Analysis From 10 Randomized Trials. J Am Coll Cardiol. 2016;67(14):1674–83. 3 Gerber, et al. Atherosclerotic Burden and Heart Failure After Myocardial Infarction. JAMA Cardiol. 2016;1(2):156-162. 4 Fitch K, et al. The Cost Burden of Worsening Heart Failure in the Medicare Fee for Service Population: An Actuarial Analysis. Milliman Client Report. March 2017. 5 Warda HM, et al. (2005). "Effect of intracoronary aqueous oxygen on left ventricular remodeling after anterior wall ST-elevation acute myocardial infarction." Am J Cardiol 96(1): 22-24. 6 David SW, et al. Evaluation of intracoronary hyperoxemic oxygen therapy in acute anterior myocardial infarction: The IC-HOT study. Catheter Cardiovasc Interv. 2018;1–9. 7 Spears JR, et al. Aqueous Oxygen Attenuation of Reperfusion Microvascular Ischemia in a Canine Model of Myocardial Infarction. ASAIO Jour. 2003 Nov-Dec;49(6):716-20. 8 Bartorelli A, et al. Hyperoxemic Perfusion for Treatment of Reperfusion Microvascular Ischemia in Patients with Myocardial Infarction. Am Jour of Cardio Drugs. 2003. 3(4); 253-263. TherOx announced FDA approval for its SuperSaturated Oxygen (SSO2) Therapy, the first heart attack treatment since PCI to reduce infarct size.